Wow! start of a new month and still pretty light on the product drops. This year is so different from last year around this time. Nothing for me today 🙁 and I returned the Off The Mat Jacket I picked up last week. I may order it at a later point but I just wasn’t 100% convinced that I’d get a lot of use out of it, and I wish they’d reduced some of the neck bulk this time around. 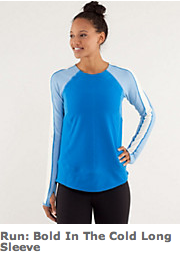 Sad because it’s really the only fleece we’ve seen from Lulu this winter. What did you guys order tonight? 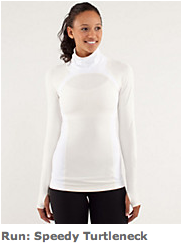 The Run: Speedy Turtleneck looks cute. I was looking forward to a Beaming Blue CRB, or a Laceoflage CRB, or those darn Ebb and Flows out in Australia right now – maybe Thursday. I just wish they’d leave the upload to one day per week if they are going to have such small uploads. One fuller upload is much better. "Product Drop Monday! Scoop Neck Tanks are Back!"